After School Enrichment Program For Kids - Become a Guide! Turn your after school enrichment program into a learning adventure! Welcome to Club Brain Chase! We’re delighted that you’re interested in becoming a Club Brain Chase Guide to lead young adventurers through a memorable journey of online learning and treasure hunting. We are now forming teams for the Summer 2016 semester, kicking off June 20, 2016. Your mentorship will give students academic enrichment opportunities while having fun and learning in a whole new way! Plus, as a Guide you are awarded a teacher grant. And don’t forget the opportunity to be the Brain Chase Spring 2016 winner and take a trip your students will never forget. Interested in starting a team of your own? Email clubs@brainchase.com or download this brochure to get started. 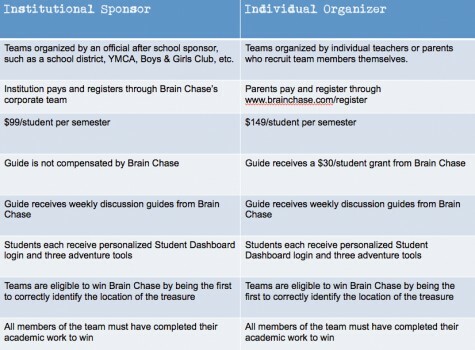 Brain Chase offers a unique motivation to students to do supplemental academic work online: participation in a massive treasure hunt for a trophy, cash prize and trip to dig them up. Through personalized Student Dashboards, students link to some of the best online curriculum providers available today and track their academic work on those partner sites. When they’ve completed the required work each week, they unlock an original animated adventure series full of clues to the location of the real-life buried treasure. The first team to decipher the clues and pinpoint the location of the treasure will get a $20,000 travel budget to travel to dig up the treasure themselves. What is Club Brain Chase? 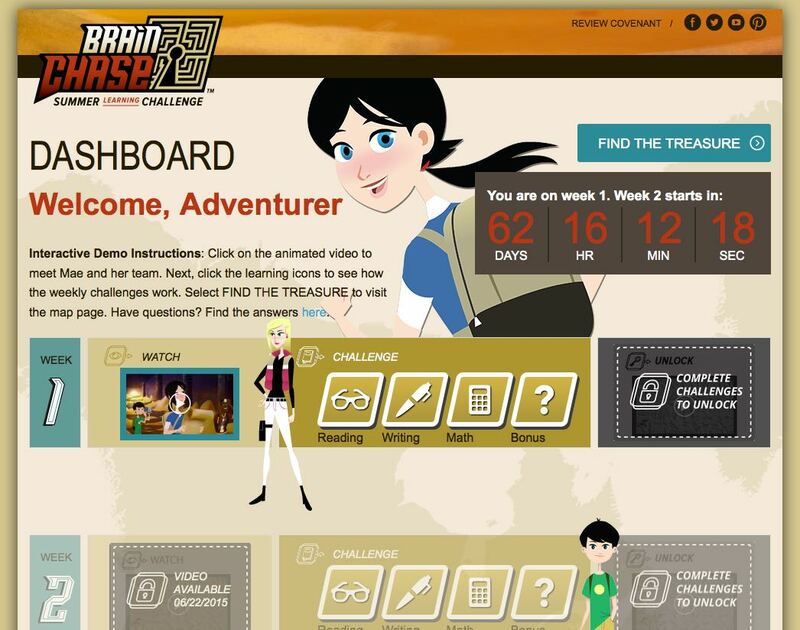 Club Brain Chase is a fun and effective way to introduce students to online learning skills and resources, while having fun and working as a team on a unique challenge: a real treasure hunt. Club Brain Chase is an after-school or homeschooling team that is run entirely by the Club Brain Chase Guide (a teacher or homeschooling parent) with the support and training of Brain Chase Productions. 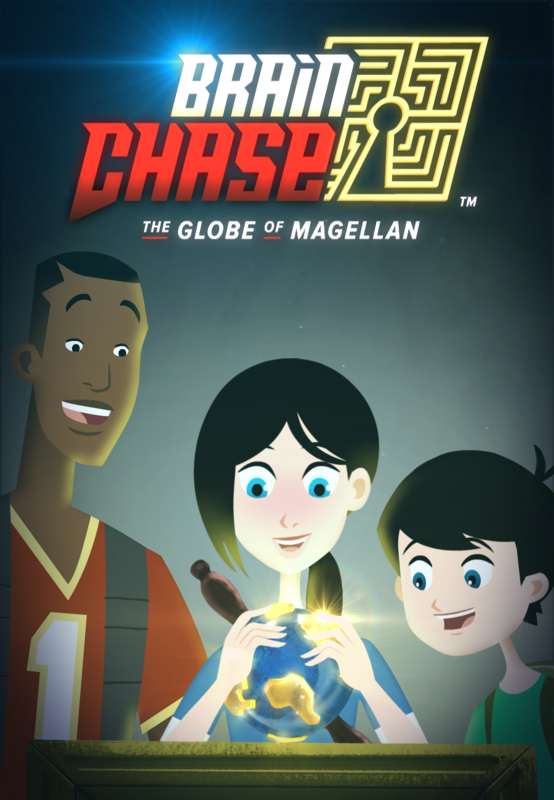 Students are required to complete about 1.5 hours of online academic work each week (although a Guide can increase this work requirement by working directly with Brain Chase), including work on the Bonus Challenge and Treasure Hunt. Typing: Complete required lessons through typing.com designed to improve keyboarding skills. Yoga: Participate in 60 minutes of yoga each week through YogaMeDo.com. Cooking: Students will watch videos teaching them how to make various dishes and will then follow the instructions in the videos to prepare those dishes. The Brain Chase Student Dashboard tracks adventurers’ online academic work through curriculum partners’ sites. As the Club Brain Chase Guide, you will be responsible for recruiting students, securing a weekly meeting location, and leading weekly meetings. 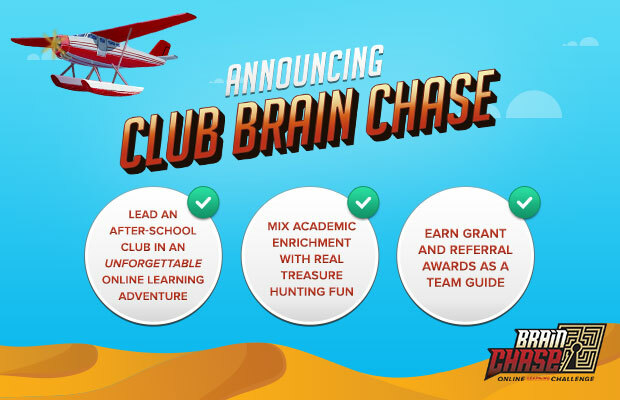 To honor your commitment as a Club Brain Chase Guide, Brain Chase will award you a teacher grant worth $50 x each Club participant. Who is Club Brain Chase for? Club Brain Chase is for students in 2nd through 8th grade. Team members can be from the same school with a teacher as Guide, a homeschool group with a parent as Guide, or an independent group of friends with a parent as Guide. Students of varying ages can be in the same Club since all students are responsible for doing their own academic work at their own level, although work on the Bonus Challenges and the Treasure Hunt will be more streamlined if students are roughly the same age. Brain Chase offers supplemental academic enrichment, so it is particularly suited to students who need out-of-school-time reinforcement of things they are already learning in their classrooms, or students who want to go above and beyond what they are already getting in their classroom. All of the academic work can be tailored to the skill level of the individual participant. 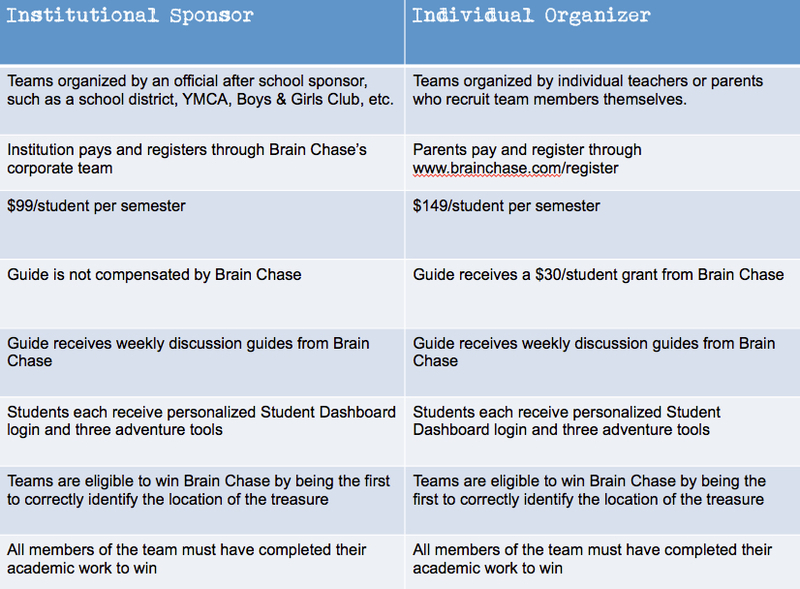 A Club Brain Chase team must have a minimum of 5 participating students. Brain Chase recommends teams include between 10 and 20 participants. More than one Club can exist in the same school. When does Club Brain Chase run? The Spring 2016 semester of Club Brain Chase kicks off on Monday, February 8th, 2016. On any day that week, your Club can host its first meeting and access the Student Dashboard, videos and first week’s Bonus Challenge. The Club runs 9 weeks, including a floating week for Spring Break and an additional week for completing the academic work and treasure hunt at the end. A specific schedule will be available in January. What does a Club do in weekly meetings? How much academic work is required? Brain Chase partners with writing, reading, language and math curriculum providers and the Student Dashboard keeps track of the amount of time a student spends on each. Book Club: Read and discuss various books with other Brain Chase Students. Individual academic work totals about 1.5 hours a week. Students can complete the required weekly work during Club meetings each week or on their own at home, but there is no limit to how much additional work students can do on their own. Students can log into their personal Student Dashboards whenever and wherever to access the Brain Chase curriculum partners. Weekly Bonus Challenges are done in a Club group each week, and the treasure hunt is also worked on in the group setting. Remember that to be the winner, all Club participants must have completed all of the academic work in addition to pinpointing the treasure’s location. What are the responsibilities of the Guide? What is the treasure we’re looking for? For the Summer 2016 semester, adventurers will be looking for the Mask of Tomoe Gozen. Tomoe Gozen is an ancient female Samurai known for her beauty, skill, and courage. Her mask is said to be made of dark metal, with gold embellishments. Intrepid members of the Grayson Academy of Antiquities – Mae Merriweather and her brother Max, friend Sean Drake and nemesis Savannah Bryce – are looking for the Mask in the Brain Chase animated adventure series, but the treasure is real: the Globe is really buried somewhere in the ground! Be the first to pinpoint its location and you will be awarded a $20,000 travel stipend to dig it up! How much does Club Brain Chase cost? Weekly discussion outlines for the Guide to foster lively class collaboration on the treasure hunt. For example, one week’s clues may require deciphering Morse Code, and Brain Chase will provide additional materials and tips to help a Guide lead the Club in learning about Morse Code. What is the grant award for hosting a Club Brain Chase? To honor each Guide’s commitment to hosting a Club Brain Chase, Brain Chase will award you a teacher grant of $50 for each Club participant. If the team is organized by a homeschooling or independent parent, the organizing parent will be awarded the grant directly. In addition, a Guide will also be awarded a $100 grant for referring another teacher to start his/her own Club. What are the differences between a privately organized Club team and a team sponsored by an institution? Please see this chart for differences between institutionally-sponsored teams and privately sponsored teams. How much training is required for Guides? We want Club Brain Chase Guides to always feel that they can reach out to Brain Chase with any questions or concerns, and Guides will always have access to the Brain Chase team. Each Guide will be required to attend one 45 minute training session via conference call before the start of the program in February. (There will be several of these scheduled at different times to meet your scheduling needs.) In these training sessions, Guides will learn about the Student Dashboard and the Guide’s Dashboard, how to help with basic technical troubleshooting, how the treasure hunt works, etc. How does a Club win? A Club wins Brain Chase by being the first group to successfully pinpoint the location of the real buried treasure on the Brain Chase Google Map. This is done by studying the clues revealed in each week’s animated episodes, and deciphering the riddle they create. While students are responsible for doing their own academic work, a Club can spend their weekly meeting working together (with the direction of the Guide) on deciphering the clues and delving into the history, geography, codes or science they refer to. In order for a Club to win, it must not only be the first to pinpoint the treasure’s location, but the Club’s participants must have all completed the required academic work. What happens if my Club wins? 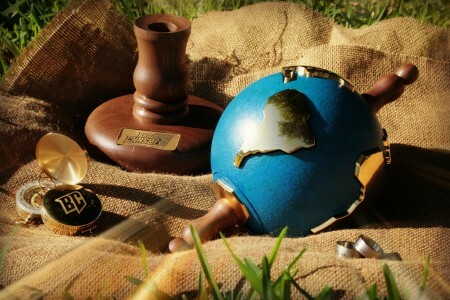 If your Club is the first to complete all of the required academic work and pinpoint the location of the real-life buried treasure on our Google Map, Brain Chase will provide your team with a $20,000 travel stipend to pay for your Club members to fly to the treasure’s location and dig it up. All travel plans and logistics are the responsibility of the Club and its Guide; Brain Chase provides the flat travel stipend and tools for digging up the trophy. If the winning Club decides it wants to use more than the provided stipend on the trip, it is the Club’s responsibility to raise the money from the school, parents or fundraising events. What if my Club doesn’t win? Even if your Club isn’t the first to solve the treasure hunt, the rewards of Club Brain Chase include increased familiarity with premier online resources and an unforgettable adventure in deciphering and riddle-solving. If Guides would like to provide rewards to their students who complete Brain Chase, they are free to determine their own prizes. 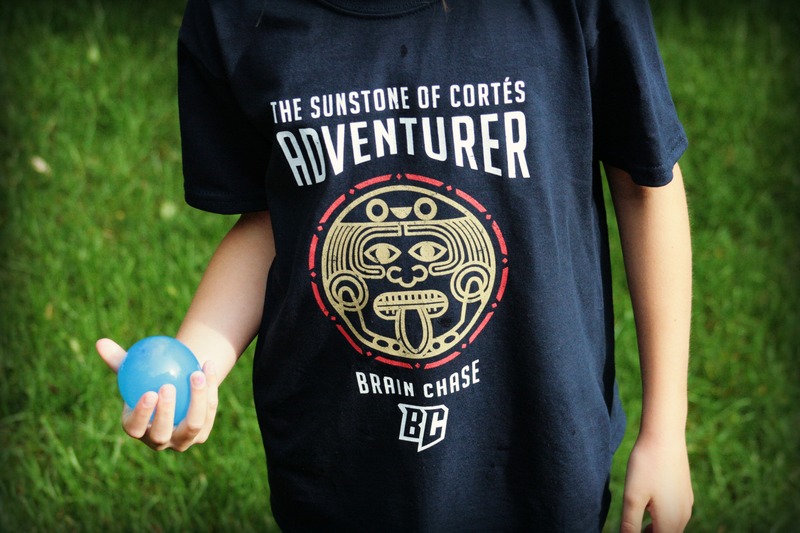 Brain Chase sells branded t-shirts, backpacks and iron on patches that can be purchased at additional cost as awards for these students. Alternatively, a teacher or school could determine a completely different prize, or give parents the option of rewarding their student. Each Club Brain Chase Guide who independently organizes his/her team will receive a teacher grant worth $50 for each participating student. Guides assigned by after school programs or school districts will not receive a grant. Ready to get started? Email clubs@brainchase.com.